After a recent problem burning a DVD I decided I wanted to view the numerous ImgBurn .ibg files saved on my system. I was dismayed to find that ImgBurn has no internal support for these files but relies on DVDInfoPro to provide a graphical view of these files. While DVDInfoPro offers quite a few outstanding features it is, unfortunately, a trialware program and a quick bit of research at the VideoHelp website (The same site that introduced me to ImgBurn) revealed quite a few negative opinions towards this aspect of the program and the programs author. As some what of a "shade tree" programmer I decided to make a weekend project of creating a freeware program that will allow people to view the .ibg files generated by ImgBurn. I have attached my first pathetic attempt at such a program. The program is a work in progress. I am currently working on the RPM plot calculations and the ability to use language files. Any suggestions or comments concerning the program will be appreciated. To be honest, I wasn't exactly over the moon when DIP went shareware. I thought I had an understanding with the guy but I only found out about it the same time everyone else did - and that was by downloading the latest version and seeing it ask me for a serial number etc. So anyway, thanks for taking the time to put this together and I hope you don't mind if I just make a few passing comments?! You need a scale for the RPM line really, it looks odd without one. Ditch the big 'drag a file to open' it type text (looks a bit tacky?!) and just add a simple (read only) edit box and a browse button. If the user D+D's onto the graph box then update the edit box etc. The bold text for the graph axis doesn't improve the look and personally I don't think there's any need to have it bold. It would be a lot nicer if the toggle buttons were themed too - but then you'll have to rethink how the colour reference is displayed and perhaps just have an indication by the side of the button instead? If you're ok to continue to tweak it here and there, I'll stick it on the download page (giving you credit of course) when it's done. It won't open the attached IBG from a BD burn. It also won't open an IBG from where the user has just done a 'Read' operation on a disc. My graphs looks the same as your graph in my Vista computer. Could be a non-English OS thing? Oh and it could really do with (or rather its 'needs') the ability to open an IBG passed as an argument when you run the program. 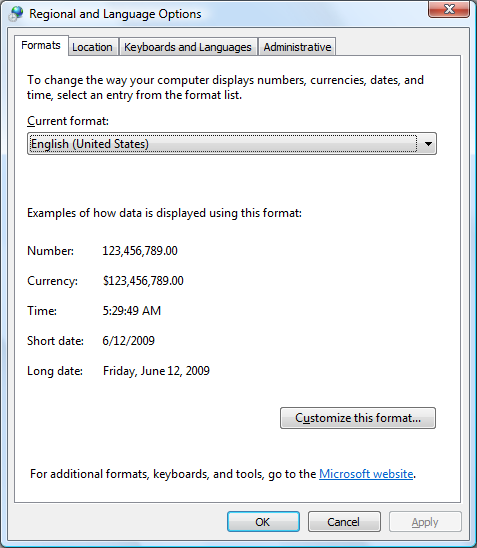 I'll run a test on my computer to switch Vista to English as default language, to see if that makes a difference. Having the ability to save in .png format would also be nice. It only seems to save a pic of the entire desktop (mutliple screens too, if you have them) at the moment, I'm sure that could be tweaked. if i remember rightly , weren't there things that had to be tweaked with dvdip originally for non english OS? These kinds of issues are normally caused by floating point values that use a ',' instead of a '.' etc. EDIT: If I set my decimal seperator to ',' and my digit grouping to '. ', my graphs are messed up too. So the important thing where BurnPlot is concerned is to always use '.' for the decimal seperator. The grouping one shouldn't even come into it as my values in the IBG do not use it and that just leaves ',' as the list seperator (i.e. used between the various values). it would be really nice if ImgBurn had its own "DVDInfoPro" !!! As LIGHTNING UK! pointed out, most of the problems you are having stem from an OS running in a language other than English and the use of different plot data seperators. As I mentioned, I put this together last weekend and never even thought about handling foreign language conventions. Currently, BurnPlot expects the plot values to be in CSV format and uses string comparisions to pick up the burn file information and detect the end of burn and verify plot data. Both of these go right out the window when faced with a language other than English and the use of a '.' instead of a ',' to seperate the plot data values. I will try to implement checksum verification on the next version and then I can eliminate the string comparisons making the program language independent. (I hope !) I will also check for the plot data value seperator type to solve that problem. @ LIGHTNING UK! - I don't mind tweaking the program if people feel it may be useful. I appreciate your UI suggestions and will implement them. The .ibg file you attached has an anomaly I have not run into with all the .ibg files I have on my system. 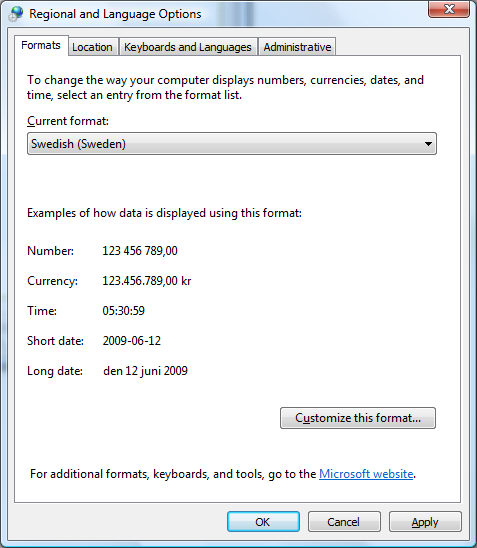 The file info shows "DATA_SECTORS=2468832". The last burn data sample sector count = 2468832 but the last verify data sample sector count is only 236736. This allowed the program to over run the data and caused the error you received while opening the file. I will fix that. Can you attach a read only .ibg file so I can see why it won't open ? @ cornholio7, Cynthia, and eSkRo - Can you attach the .ibg files you used to create the plots shown in your posts ? I will use them to verify the efficacy of my modifications. Again, thanks for the input. I will see what I can do and upload a new version in a couple of days. It will definitely be useful, I just hope you don't mind spending a bit more time on it to get it 'just right'. ImgBurn will always output the values seperated by a ',' and it'll always use a '.' for the decimal symbol. So I'm wondering if your development environment is actually doing the language stuff for you and 'trying' to read in (or convert) the values based on the regional settings? Likewise, the CPU usage value can be -1.0... which basically means it wasn't available / captured. 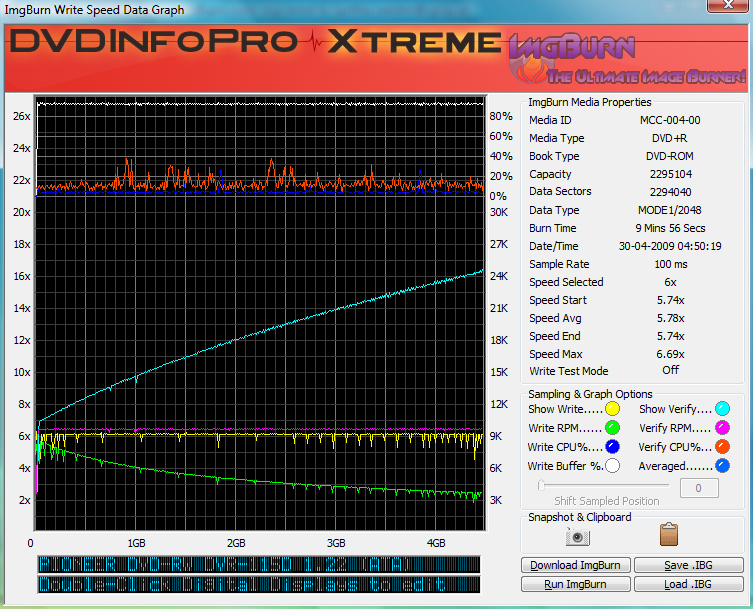 For a Read / Verify only IBG, there won't be the normal block of values that deal with the write speeds. Perhaps that's where the program is currently falling over. Thanks for attaching your .ibg files. Unfortunately, they seem to open properly on my system. (See attached pictures.) It looks like I am dealing with a Windows conversion problem. From your screen captures it looks like you are both running Vista - is that correct ? Could you open your .ibg files in notepad and send me a screen capture so I can see how they are presented on your systems ? @LIGHTNING UK! 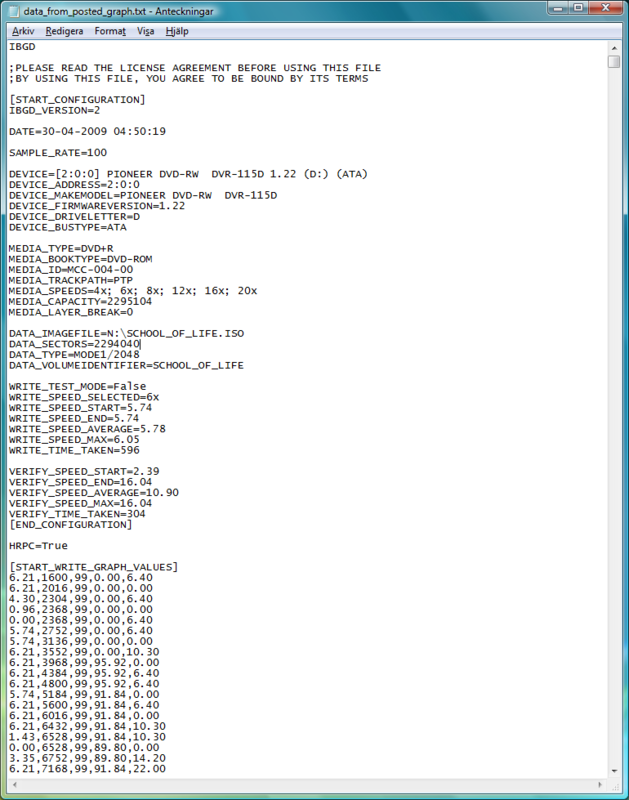 - I am not sure how DVDInfoPro is coming up with the Write RPM plots. My Verify RPM plots seem to match DVDInfoPro but my Write RPM plots not so much. Are the Write/Verify RPM values in the .ibg files direct RPM values or are they a percentage as are the CPU and Buffer values ? Please attach a read only .ibg so I can use it to verify my program changes. Running Vista 32 bit Ultimate. cut out major part due to character posting limit. 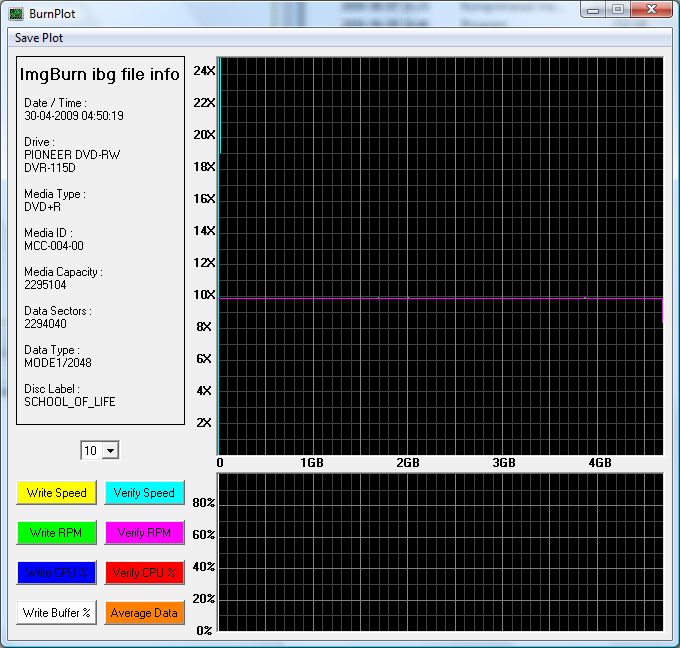 There is no RPM data in the IBG file, it's generated by DIP. If you're unsure of what's what in the file, you only have to ask... there's no need to attempt to reverse engineer it. Regarding the floating point conversion issue (or whatever it is), if you can't find a function that doesn't attempt to use the localised decimal separator, just do a string replace on the '.' within the IBG string value and replace it with whatever the conversion function would be expecting. If it's more an issue of breaking up the line into the various values, are you actually parsing the lines looking for commas' to separate the values or are you using some function to split the line for you (which might then be using the wrong character) ? Remember, im using Windows XP SP3 French! but it seems I am wrong about the Write RPM/Verify RPM data - what do these data entries actually represent ? 2. Can you show me the algorithm used to generate the checksum shown at the bottom of the .ibg files ? BurnPlot is written in VB6 and I am using the split function (With ',' as the separator) to parse the graph data lines. I am confused as to why this is apparently not working on Cynthia and cornholio7's systems even though their .ibg files work properly on my system and the screen captures show that their systems are presenting the .ibg files in a fashion that should parse properly with the split function. I will add a check for the separator value and see if that corrects the problem. BurnPlot is not dealing well with .ibg files that contain burn or verify only data which explains the errors you and eSkRo received from the .ibg files you provided. A few modifications should fix that. @Everyone - As I mentioned in my original post, BurnPlot was created over a weekend and only tested with the .ibg files I had on hand. (4.7GB SL DVD-R Burned and Verified) Thanks to your input I will be able to correct the problems that I never knew existed. Feel free to send me as many .ibg files as you wish so I can continue testing. Don't forget, 'CPU % Usage' can and will be -1.0 if it hasn't been captured. I will send the CRC info via PM. It's not actually that important and is really only used to check people aren't making up the values! This seems to be the issue with us that are not English. @ Cynthia - Thank you for the information. It will be very helpful. @ LIGHTNING UK! - I have not had much time to work on this during the week but I managed to make a few of the UI changes you suggested. I added a "browse for file" menu button but removed it because VB requires an OCX to access the common dialog used for file browsing. A quick test on the only machine I have without the VB IDE installed reveals that the program will not run because a virgin XP installation does not have the required OCX. I would like for this to be a "no installation required" type of program so I hope the D&D will be sufficient. The horizontal graph scale is currently only acurate for 4.7GB DVD's. Working on it. The vertical graph scale is currently fixed and does not provide adequate head room for CD write or verify speeds. Working on that too. This program is intended to be a companion to ImgBurn so any suggestions as to what type of a theme you would like to see on the plot toggle buttons ? @ Everyone - I have attached a new version of the program that (On my system at least) opens and plots all the .ibg files you have provided. If you have time, please try it on your system to see if it will work in your environment. When you open an .ibg file, this version of the program will create a text file on your desktop that contains the burn/verify data as parsed by the program. If you have a problem with an .ibg file please attach the text file and the .ibg so I can see what is going wrong.